Star crossed lovers need not apply, for an astrologically inspired wedding is guaranteed to produce a blissful union! You might know that in many cultures, astrology has some sway over nuptials, and if you’re totally into astrology or just fancy something a bit different for your big day then look to the stars! Did you know you can elect an auspicious wedding date? 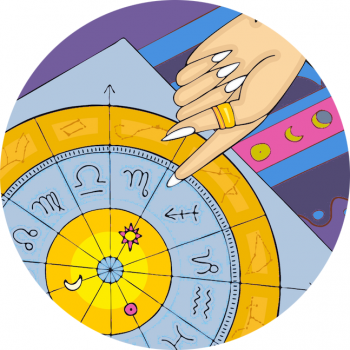 That’s right – weddings have horoscopes too! The premise is that: what begins at a specific moment holds the seeds of that matter. We know that the birth chart holds information – casting a chart using a person’s moment of birth tells astrologers something about how the person’s character might unfold. Electional Astrology determines the moment something will truly begin (when the couple says “I Do”) and what astrological factors contribute to making a marriage unfold to its best. Check out the FREE step-by-step tutorial on Big Sky Astrology, where you can choose your own date (not for the beginner astrologer!) or the Wedding Date Astrology Workshop is a 28-page workbook (and videos) to walk you through the process. You can allude to your astrological celebration before the wedding, designing invites that reflect your chosen celestial theme. Show your love in a map of the heavens and give it a stellar seal of approval, with a constellation stamp by Native Bear. You could really go to town here. Following on from your big days horoscope you can read into the dynamic of the chart and see where its energies might be lacking. If your wedding calls for an increase of earth energy try a woodland setting, if it needs water marry by the sea or a lake. If fire is what you need add flames and more religion – more faith! For air be sure to perform your nuptials in a wide open space. You might like to use astrological comparabilities to play Cupid at your wedding – have guests send you their particulars and lets stars align! I love the design feature at this wedding, where the couple have used constellations as their table names. They direct guests to a point in the universe with delicate string – so stylish! There are some wonderful celestially inspired dresses at the moment from Valentino, and this beautiful dress (above right) was all about the moon and stars, seen at Alexander McQueen Fall 2014. When it comes to jewellery your options for astrology accessories are plenty! But how to honour your special day subtly and stylishly? Consider birth stones in the jewellery you choose, selecting precious gems that match you and your partners zodiac signs. See my favourite cosmic wedding dresses here. Personalised horoscopes will work as favours for the Maid of Honour, Best Man, even the flower girls and page boys.